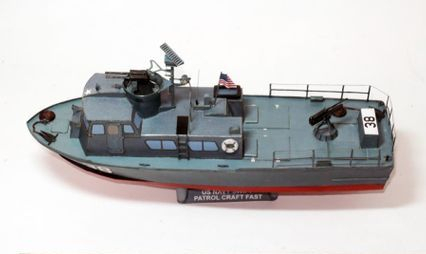 Patrol Craft Fast (PCF), also known as Swift Boats, were all-aluminum, 50-foot (15 m) long, shallow-draftvessels operated by the United States Navy, initially to patrol the coastal areas and later for work in the interior waterways as part of the brown-water navy to interdict Vietcong movement of arms and munitions, transport Vietnamese forces and insert SEAL teams for counterinsurgency (COIN) operations during the Vietnam War. The first Swift Boats arrived in Vietnam in October 1965. 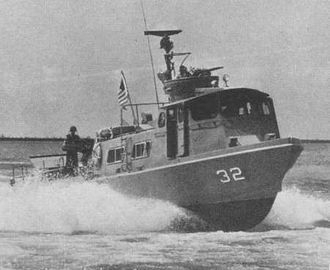 The boats were initially used as coastal patrol craft in Operation Market Time, interdicting seaborne supplies on their way to the Viet Cong and the North Vietnamese Army in South Vietnam. 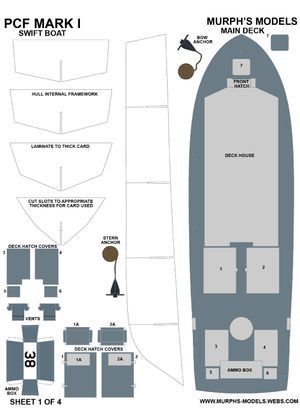 However, the design's shallow draft and low freeboard limited their seaworthiness in open waters. These limitations, plus the difficulties being encountered in the interior waterways by the smaller, more lightly armed PBRs, led to the incorporation of Swifts to patrol the 1,500 miles of rivers and canals of Vietnam's interior waterways. Swift Boats continued to operate along the Vietnamese coastal areas, but with the start of Admiral Elmo Zumwalt's "SEALORDS" riverway interdiction strategy, their primary area of operations soon centered upon the Cà Mau Peninsula and the Mekong Delta area in the southern tip of Vietnam. Here they patrolled the waterways and performed special operations, including gunfire support, troop insertion and evacuation, and raids into enemy territory.